Hotel Wailea is a story of reinvention, about turning big ideas into even bigger moves. The tired Maui property used to be a private Japanese club. The design team instead created a romantic couple’s getaway that is now worthy of becoming the hotel chain Relais & Chateaux’s first Hawaii location. While the bones of the existing structure were regal, the challenge was to create an exotic and rustic atmosphere while sidestepping the stereotypical Hawaiian hotel aesthetic. For one thing, the hotel is not located on the beach. It is, instead, perched on a hill overlooking the ocean, the tiny islet of Molokini, and the south Maui coastline. Our design team reoriented the entire hotel to take advantage of the panoramic view. 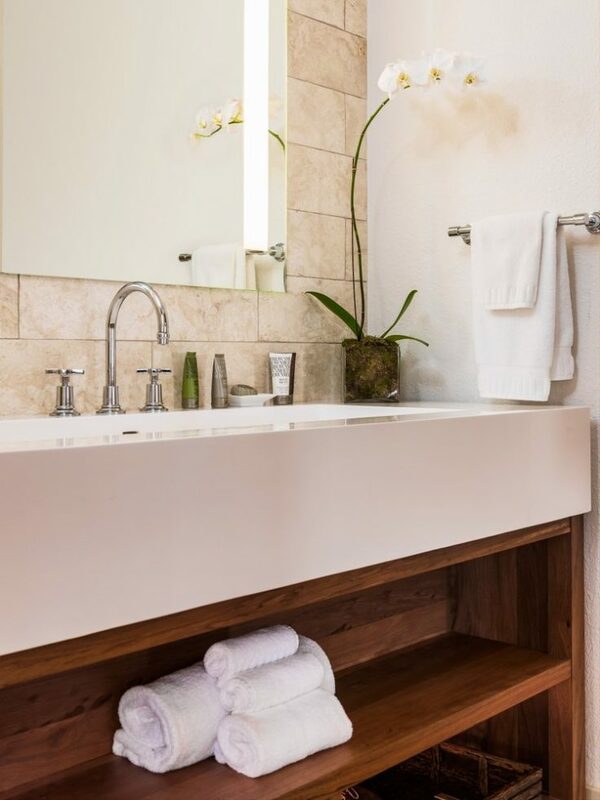 Guest rooms were designed to feel like a “home away from home” – not just another hotel room. The oak hardwood floors are a switch from the standard hotel carpet. 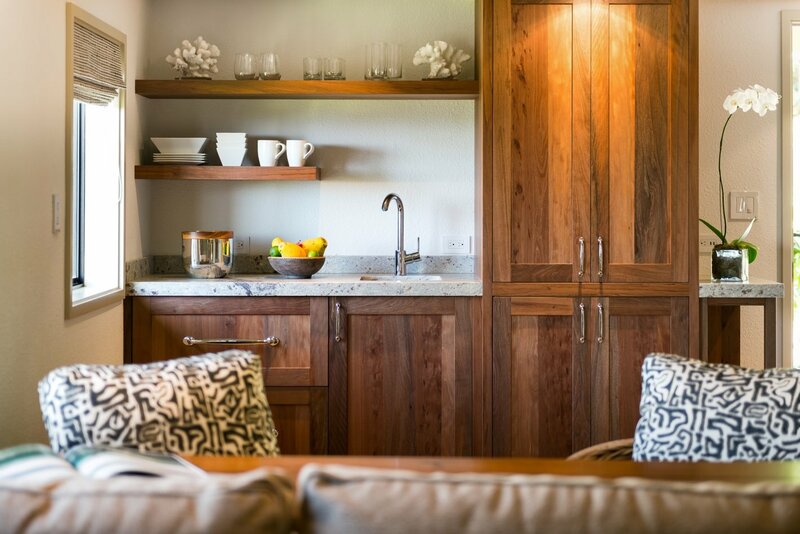 A small kitchenette consists of handcrafted ohia wood cabinetry and flame-brushed granite providing a durable but clean look. Sliding barn doors lead to the bathroom and custom trough sinks make it feel like a luxury home. 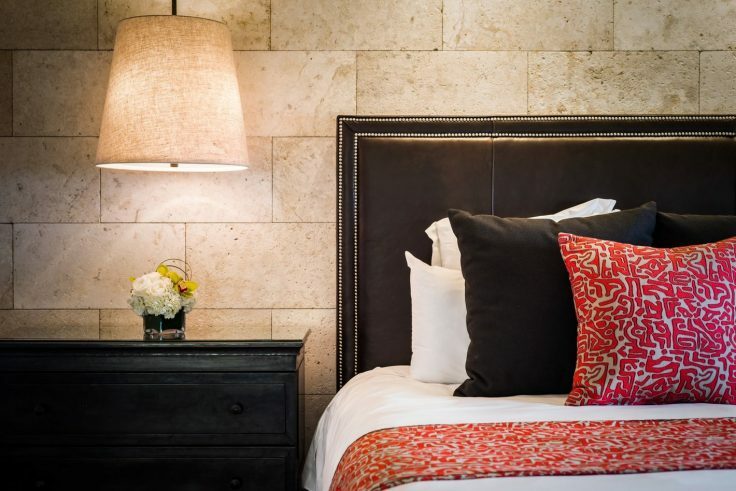 The headboard wall is anchored with a coral stone which adds a level rustic elegance. The stone is repeated as a finish throughout the property. On either side of the bed, in lieu of table lamps, elegant pendants hang from the ceiling. Furniture, from the console table to the sofa, is oriented towards the ocean allowing guests to take in the dramatic views from anywhere in the room. On the large lanai, guests can have a romantic dinner or lounge on the daybed to watch a glorious Maui sunset. At the pool, the team created the juxtaposition of “by-day” and “by-night” atmospheres. During the day, there is a fun and colorful vibe. From a mai tai at the pool bar to lounging in the custom-designed cabanas, there is a lively energy. By night, the pool area transforms into a moody, romantic gathering place for couples. 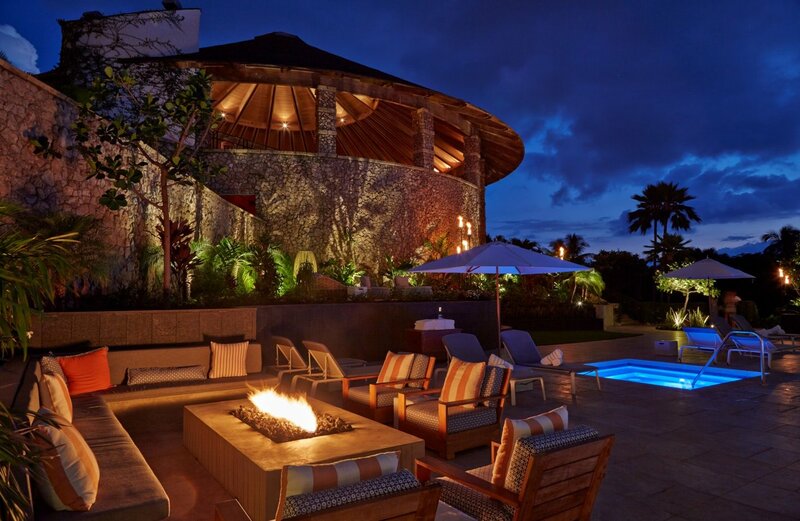 The fire pit and softly lit cabanas provide the perfect backdrop for cocktails. Beginning as a simple update, this project evolved shortly into a full scale renovation. Internationally-recognized, Hotel Wailea has become a stylish and modern destination for couples from around the world.